Date and Time: July 28, 2016 at 11:00 a.m.
Place: Third and Constitution Avenues, N.W. (Washington, D.C., July 26, 2016) This Thursday, the Honorable Richard J. Leon will hold oral arguments on a case brought by Larry Klayman, a former federal prosecutor and founder of Judicial Watch and Freedom Watch, on behalf of victims of the deadly drug Levaquin, manufactured by Johnson & Johnson. Arguments before the Court will focus on the defendants, former FDA Commissioner Dr. Margaret Hamburg, her husband Peter Brown and his billion dollar hedge fund, Renaissance Technologies, L.L.C., and Johnson & Johnson, having allegedly engaged in a criminal racketeering conspiracy to inflate the price of Johnson & Johnson stock by suppressing material information about the deadly dangers of Levaquin, an antibiotic used for routine infections. As can be verified independently from U.S. Securities & Exchange Commission reports, Renaissance Technologies, the hedge fund for which Hamburg’s husband Peter Brown serves as Co-CEO, held as much as half a billion dollars in Johnson & Johnson stock while Hamburg was FDA Commissioner. 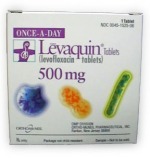 Thus, as alleged in the amended complaint, if Hamburg had allowed the FDA to disclose Levaquin dangers, which already has killed over 5,000 persons and left tens of thousands debilitated with life-threatening illnesses, it would have had a negative impact on the stock her husband’s company held in Johnson & Johnson. Instead, Hamburg, her husband, Renaissance, and Johnson & Johnson are alleged to have profited handsomely.